I think coral is such a versatile colour which can be worn day or night for a youthful, summery look. 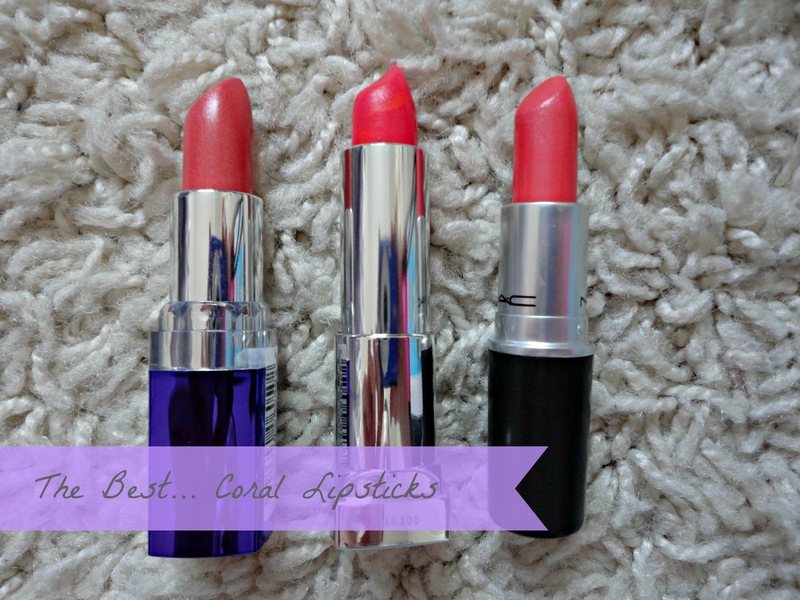 Firstly, Rimmel’s “Soft Coral” is a lovely lipstick for anyone who’s unsure whether coral will suit them or not, as it’s quite sheer but can be built up. The swatch above shows the colour after 2/3 swipes. Also, Rimmel lipsticks are such good quality for a drugstore brand, so this lipstick would be a great one for if you just want to dip your toes into the trend. Next up is Maybelline’s “Shocking Coral” from their Color Sensational Vivids range. This is a super bright pink-coral which can be applied straight from the bullet for a vibrant pop of colour (like the swatch above), or patted onto the lips with your finger for a more daytime-friendly colour. This has amazing lasting power too but can be a bit drying so make sure you put lipbalm underneath before you apply this to keep it looking amazing hours later. 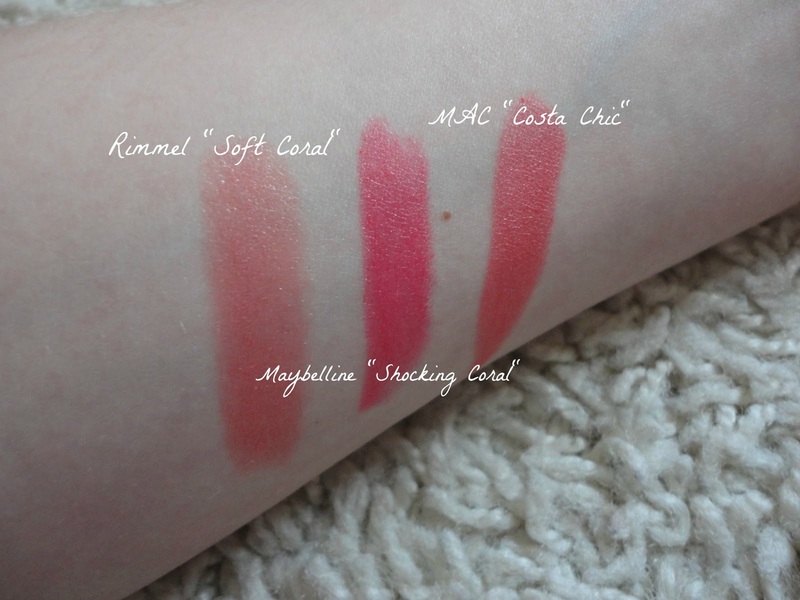 Finally, a beautiful coral from MAC in the form of “CostaChic”. This was my very first MAC lipstick and I still absolutely adore it! It is the most beautiful pink toned coral that suits literally every skintone. I’ve found that it’s really nice mixed with a pinky lipstick like MAC “Chatterbox”. Although it’s a ‘frost’ formula, I don’t find it glittery or drying at all, just a super pigmented coral sheen. It doesn’t last as long as the Maybelline one, but it doesn’t cling to dry patches and with a coat of ‘Lipcote’, I’m sure it would last for hours! The MAC costa chic is so pretty! Love love love!